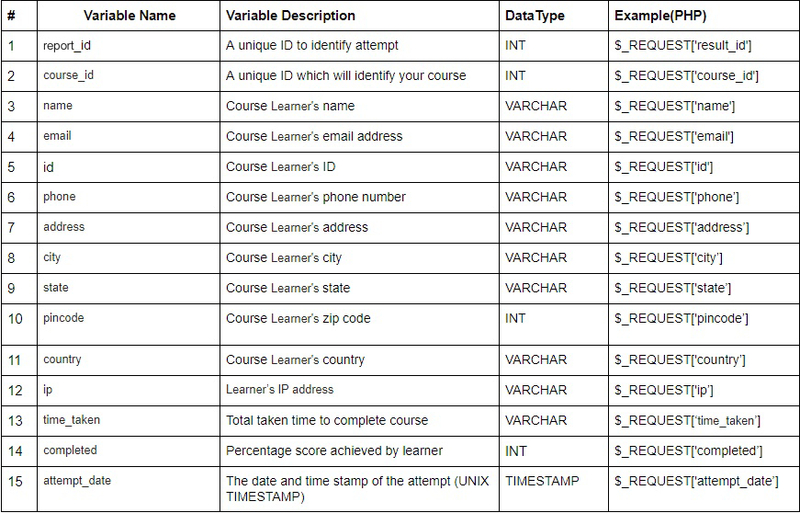 How does the API allow me to capture learners data and insert it in my own database/website? How does the API allow me to capture learners data and insert it into my own database/website? 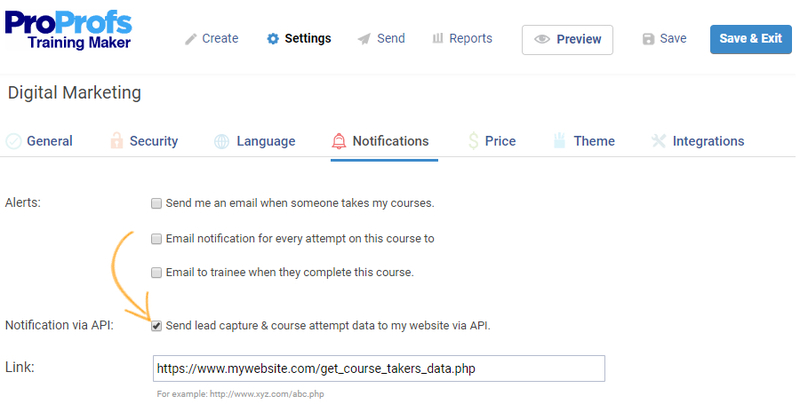 Using our API, you can easily capture course taker's data on your website. Obtain 'leads' into your database, information such as name, email, etc. of course takers. Acquire 'contacts' of people taking your course in SalesForce, or any other CRM system. Triggering emails or any other process on your website when someone takes the course. This feature requires minor programming effort at your side to accept the data sent by ProProfs. Please note that this API is supported only in some of our high-end premium packages such as those for business and enterprises. To get started, you would need to make a file (your callback script) which will accept the data sent by the course through 'REQUEST' method. Whenever someone takes your course, it will call your callback script to accept the data. After accepting the data, you can write any custom code such as required for inserting the data into your database or CRM or triggering some business logic process. Go to the Settings page, click on "Notifications" and check the box under the label "Notification via API." Type the call back URL indicating where the script is on your site and hit Save. It is the URL of the script which will accept the data in REQUEST method. *The below screenshot is an example used to depict the live scenario, in this example we use a PHP path as the call back URL indicating server location of data storage. Users have to use the call back URL in their script for the server location of data storage. There are 15 total attributes which we support and pass them to REQUEST when someone takes your course. It is similar to REST or SOAP API's. If you are using PHP as server scripting, you can use the following example to test this feature. Step 2: PHP: Click here to download the PHP script (get_course_takers_data.php) file, and upload it on to your web server. "Allow capturing course taker's data for inserting in my own database/website"
// Means bonus points has been assigned and this is update request to update already stored attempt record. // This block will never execute because status will either contains "new" or "update"
ProProfs originates all requests from public facing IP '67.228.18.170'. Ensure that this IP is not blocked. After unblocking the IP, check if you are receiving requests from our server. You can execute the snippet titled 'course_response_test.php' on your server. Change the email address in this script to your email id. Then update the callback URL of the course under "Edit Settings" -> "Notifications" to call this URL. Check if you receive an email after you complete the course. It validates if responses from ProProfs are reaching your server. Related article: How does the Single Sign-On (SSO) integration feature work? Feel free to contact us, if you need further assistance.